With a debt mounting to Rs.7,000 Crore ($70 billion), Kingfisher Airlines has already cancelled all international flights and now, NDTV reports that no one in India or abroad wants to purchase Kingfisher Airline tickets, even though the CEO Vijay Mallya confirmed on March 20, that the airline will run 125 domestic flights. Six months ago the carrier had the second-highest market share and operated a king-size fleet of more than 60 aircraft, a number that has now come down to 16. After being unrecognized by the International Air Transport Association (IATA), the airline does not have any international booking platform and so it recently decided to terminate overseas operations for an indefinite period. In India, too, the situation is not good as a majority of ticket-booking agencies are reluctant to do business with it due to growing uncertainty over the future of the airline. 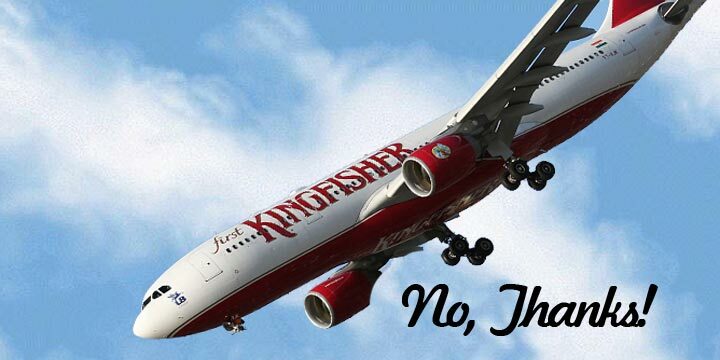 According to reliable sources within the beleaguered carrier, the Goa office of Kingfisher was shut down on Sunday. The airline plans to down shutters on more than half a dozen offices in different cities and is likely to come out with a detailed list today. Read more at: Kingfisher Airlines tickets? No, thanks!